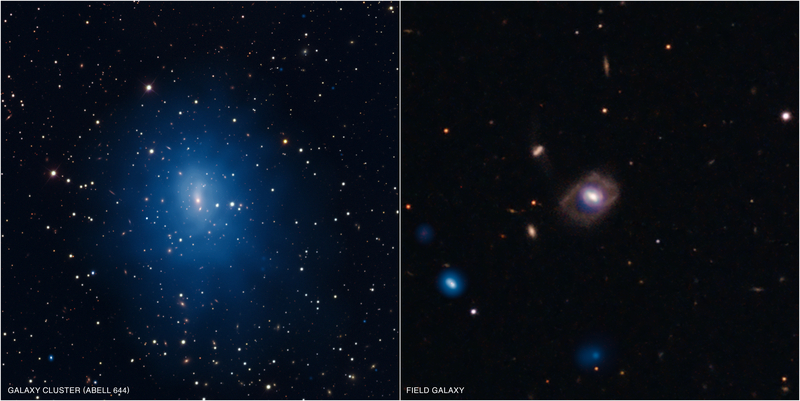 Abell 644: How Often do Giant Black Holes Become Hyperactive? Coordinates (J2000) RA 08h 17m 25.6s | Dec -7° 30´ 45"
Coordinates (J2000) RA 10h 21m 47.86s | Dec +13° 12´ 28.19"
I understand elevated temperature enables particle detection by Chandra. Please explain how very hot gases can persist in the space. The same space just above our atmosphere is quite cold. Wow, that's amazing I didn't know that or even imagine that our Galaxy is embedded in an enormous halo of hot gas, that's so interesting, but can we get more information about the dark energy? because it represent I think more than the half of universe and it play an important role. To Back who asked how the galaxy got so far away: The Big Bang theory as it presently exists is said to have included a period of "hyperinflation" of the (small--then suddenly large) universe very early in its history. In addition, measurements made about a decade ago showed that even now the expansion of the universe is continuously accelerating. Actually the age of the universe as I have read in many books is close to 14 billion years old. Interesting question though and hope it gets answered by one of the Chandra team. I have a simple question. With all the talk about the universe having started with a massive explosion and it being ONLY 12 Billion years old? can some please explain the following deduction. The article shows the payoff from synergistic usage of two sets of instrumentation. Great work. Thank you for the great shots, wow very interesting, will stay open for all information. 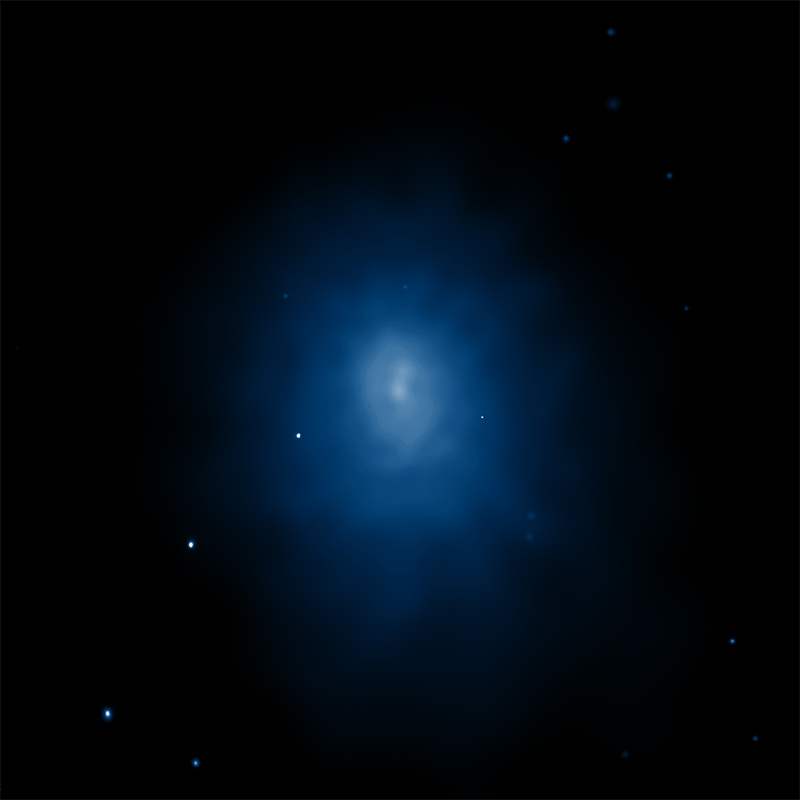 What is very interesting is the difference between a cluster galaxy and field galaxy but a middle supermassive black hole, it don't depend on the quantity and type of mater eated, what kind of star make a massive black hole, white dwarf, red magnestar, neutron star, this observation may show us that a super black hole isn't an evolution from a new black hole but depend of primaries state. Of utmost importance. If the AGN in our Milky Way is active, its radiation could destroy lifeformes on planets on a large scale. May be also on earth. This means destruction could be possible apart from destruction due to events in our planetary system and on earth. That is most interesting. So, has our galaxy been active like this in its past according to the above information? There is so much to learn, how Astronomy and Astrophysics has grown over the past Century. A very complex subject.